If you’re born in July and you are a big fan of precious stones, then you must know that your birthstone is ruby. 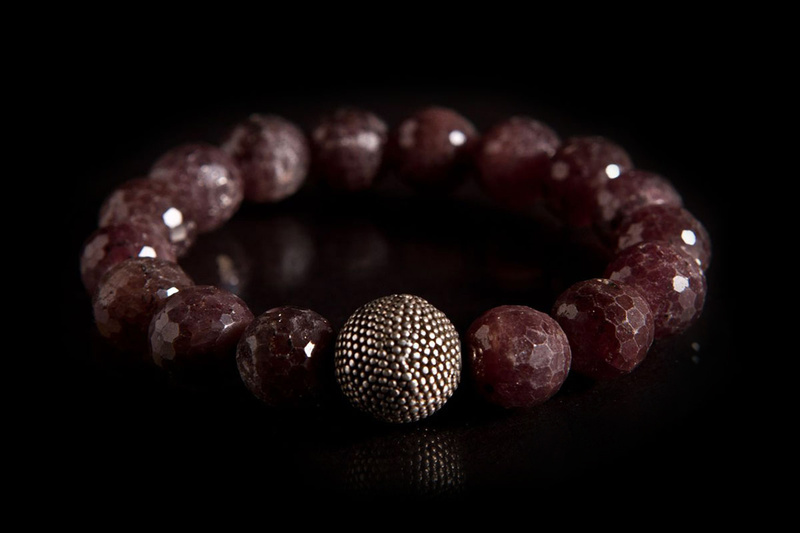 This pink or blood-red gemstone is a variety of aluminum oxide. Rubies are red because they comprise an element called chromium. Emerald, sapphire, diamond and today’s pick are known as the four most precious stones. This talisman of prosperity, protection and passion is full of meaning. It has a long history and there are many legends surrounding it. The name comes from the Latin “rubeus”. This, in its turn, is derived from “rubi”, a word used in the Old French dialect. Discover this and much more about the stone in our July Birthstone Jewelry Guide. You’ll learn all about its history, complete meaning, uses and metaphysical powers. Today we welcome you to our ruby jewelry guide. This beautiful stone is a favorite of many women and men who choose to wear it for special occasions. Rings with this stone are some of the most popular jewelry types to be worn at engagement vows, parties, and so on. They aren’t the only ones, though, and we’ll give you other examples. The birthstone of July has been an ever-present accessory in men’s and women’s fashion since ancient times. In its raw and uncut state, this gemstone works like a charm when paired with zoisite and fuchsite. India is one of the countries where it plays an important part. Several other places think of it as a talisman that protects the wearer against bad influences. Tanishq is only one of the many online jewelry shops that specialize in exquisite pieces. Their collections don’t include just one ruby necklace or a pendant. You’ll discover many 22k pieces with a refined design at a good price. This Indian jewelry store isn’t the only one with superb sets on sale. Others offer the same quality and a large number of models to choose from. Ruby rings are a great choice if you want to surprise your loved one with a heartfelt gift. The beautiful gem also makes for astonishing engagement rings. You can pair it up with a gold necklace and attach a heart to it. A set of ruby rings will match all complexions, instantly elevating any type of outfit. Wear rubies on your fingers during the day with semi-formal attire and easily transition them to night wear, pairing the jewelry with a sophisticated black dress. There are different designs to choose from, each with its genuine charm. Ruby men’s rings are popular as a gift choice, too. This amazing July birthstone keeps good company with Swarovski crystals. A ruby necklace paired with these crystals lets your special someone feel extra loved. If she or he likes to play Runescape, they’ll have a lot of fun with this gift. Even more so because of its strong symbolism. Such a necklace offers power and strength to those who wear it. A ruby choker will turn your outfit into a wonder in no time at all. If you accessorize it with a butterfly-shaped earring or a pearl ring, you’ll soon turn all heads. A teardrop ruby necklace functions equally well with dresses or an elegant pair of black pants. If you find a trusted jeweler, they’ll know how to turn rubies into splendid bracelets. Ladies who wear them will feel powerful and full of vitality. A Burmese faceted ruby was the star of Queen Victoria’s coronation many decades ago. This stone of nobility brings prosperity to people who choose to wear it as fashion accessories. The gemstone attracts both romance and devotion. It also heals you on all three important levels: spiritual, mental, and physical. To truly understand the ruby meaning for yourself, you can incorporate the precious gemstone in your jewelry collection in the form of a bead bracelet. Cartier is one of many luxury brands who uses the crystal into their creations. The latter range from clothes to bags, jewelry and everything else fashion-related you can think of. Ruby cross-shaped beads are popular accessories nowadays and have always been so. They will protect you from all the negative emotions and forces that surround you every day. Vintage ruby beads are another example of a perfect birthday gift. Celebrate friendship on White Tuesday by offering a special gift: a set of ruby earrings. Your best friend will fall in love with them on the spot. If she’s been feeling anxious, your surprise will take that away as soon as the earrings are out of the box. Keeping soul darkness away is something the gemstone has always been good at. This small natural wonder is a star among gemstones. Worn as an earring, it helps heal almost any ache, be it spiritual or physical. Chronic fatigue and bad blood circulation are only two of the afflictions rubies are able to cure. Some women favor ruby earrings over other precious stones. That is due to the meanings of prosperity and success the crystal carries. Remember Dorothy from The Wizard of Oz movie? Her famous ruby slippers carried her home whenever she whispered: “There’s no place like home”. Ever since then, more and more little girls have wanted a pair for their upcoming birthdays. The appeal of real rubies has made its way into many different cultures. English and Spanish ladies aren’t the only ones to dream of these stones. Women from Africa, Asia, and other continents would love nothing more than to be surprised with ruby jewelry. Even if they’re just slippers. The birthstone for July is the gorgeous ruby. If you want to make a strong impression on someone you like, offering ruby jewelry is key. Ruby rings, necklaces, bracelets, beads, and earrings are great gifts. Books and song lyrics praise this one-of-a-kind healing gem in many ways. Look for your loved one’s favorite tunes and novels that praise it. For more inspiration, we have an A to Z guide about other powerful gemstones. Hey Buddy!, I found this information for you: "Ruby Jewelry Guide: Find the Meaning of Rings and Necklaces". Here is the website link: https://accessgems.com/ruby-jewelry-guide/. Thank you.